Nigerian President Muhammadu Buhari’s extended medical leave is raising concerns in the most populous country in Africa. Buhari, 74, has been in London for the last two weeks receiving medical care. He had been expected to return to Nigeria on Sunday night. But on Sunday, his office released a statement saying the president was advised by doctors to remain in London to await results from medical tests. The statement did not say what he was being tested for, or how long it might be before he could return to Nigeria. The statement said the president has asked Nigeria’s parliament for approval to continue his medical leave. Richard Joseph teaches international history and politics at Northwestern University in Illinois. He said President Buhari’s absence is causing concern in Nigeria. Joseph said it could weaken his government, which already faces charges that it has not done enough to deal with economic and terrorism problems. “Obviously, there is something significant going on,” Joseph said of the reports that the country’s president would not return to Nigeria this week. Adding to the concern -- this is President Buhari’s second medical leave as president. He took two weeks off last June to be treated in London for an ear infection. Joseph said the government’s refusal to provide more information about Buhari’s medical condition has some people questioning if he will return to the presidency. It even led to people questioning on social media if he might be dead. But Joseph said it is a good signal that Buhari followed the Nigerian constitution. It says the vice president is to become acting president when the president is not available. Yemi Osinbajo is Nigeria’s vice president. He is a lawyer and professor. Osinbajo has used social media to show how he is carrying out the duties of president in Buhari’s absence. On Monday, the Nigerian government released a video interview with Osinbajo. He spoke about Buhari, saying "he’s in good shape. In the interview, the vice president also said Buhari's medical tests should be completed soon. Hundreds of Nigerians protested Buhari’s absence Monday. The march took place in Lagos, Nigeria’s largest city. Prices of food and other goods have increased as Nigeria deals with low oil prices and a devalued currency. Some of the protesters carried signs about unemployment and hunger. Demonstrators marching in Lagos Monday. 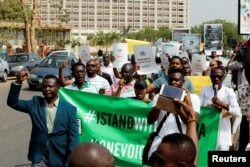 “Nigerians are frustrated and tired with this absentee government," activist Omoyele Sowore said as he marched in Lagos. Bruce Alpert adapted this story for VOA Learning English based on reports by Reuters, the Associated Press, and other sources. Hai Do was the editor.